Biafrans in Malaysia, the nucleus/heartbeat of the struggle for the restoration of the nation Biafra. It is no wonder the supreme leader of the indigenous people of Biafra (IPOB), Mazi Nnamdi Kanu, the prisoner of conscience (POC), has often described the IPOB Malaysia as his “First Love” in this struggle for the restoration of the sovereignty of the state of Biafra. While this article may not be viewed from the perspective of self-eulogy, it is important that those who, at this critical point , may be contemplating to slack on this struggle or to avail themselves to be used as a willing tool to sabotage this epic revolution by those who want to continue to hold us down in perpetuity as slaves in Nigeria, should look up and emulate the indefatigability, formidability, uncompromising and undying spirit of the IPOB Malaysia and sit up because to those in Malaysia, it is #BiafraOrDeath. READ THIS: BIAFRA: AGAIN, AMNESTY INTERNATIONAL INDICTS THE NIGERIAN ARMY OF EXTRAJUDICIAL KILLINGS, BLASTS BUHARI OVER NNAMDI KANU, EL ZAKZAKY'S UNLAWFUL DETENTION. 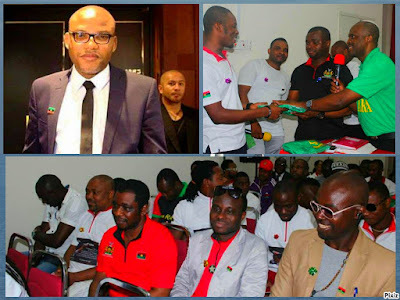 For the record, it is important to point out that this epic struggle was formally kicked off in Malaysia with a great enthusiasm by the IPOB leader Nnamdi Kanu, when he visited in 2012 and ever since then, IPOB-M has continued on the same magnitude of momentum with which they started, and are more than prepared to continue to uphold the light until the Biafra sovereignty is fully and finally restored. I have no argument that this level of enthusiasm is unconnected to leadership. After all, every great feat that has ever been achieved in any walks of life has often been attributed greatly to leadership. For instance, the seemingly unbreakable barrier of neo-colonialism, media blackmailing, and mental slavery that Biafrans had been subjugated to since receiving paper/flag independence from the British colonial masters in 1960 under Nigeria, was shattered and completely deconstructed to its logical conclusion in a matter of months by IPOB worldwide due to the unequal leadership and mastery of the enigmatic leader Nnamdi Kanu whom Nostradamus, the 16th century famed Jewish-French doctor had prophesied over 400 years ago, that “A Powerful Prince will emerge in the world at the Trigger of the Gun. He will be the envy of other princes. They (the other princes) will try to subdue his rise but all will be a failure”. It is noteworthy to recall that at the discovery of the African Continent, the name initially given to it was “The Gun”, because of its semblance to the shape of a gun. Looking at the map of Africa, Biafra (bordered and deriving its name from the Bight of Biafra) is at the position of the Trigger of the African Gun – geographically speaking. All indicators are now pointing to the fact that the Nostradamus’ predicted-powerful Prince will come from this geographical location called Biafra, which is what we are witnessing today, meaning that a sovereign Biafra is inevitable and is as certain as day following night. In searching so zealously for better leaders, it is important that we do not lose sight of the people these leaders will lead. Organizations stand or fall partly on the basis of how well their leaders lead, but partly also on the basis of how well their followers follow. Without such unique leadership style and the dedication of the followers, the IPOB could have achieved so little or nothing. Nnamdi Kanu made it pop-and-plain to his followers from the onset of this struggle that he was not a career freedom fighter who plans to dwell so long in this struggle before achieving his mandate, like those who preceded him did and failed irredeemably, but the other way round. The monumental achievements recorded so far within this short period is a confirmation of this assertion. This year has a great significance in this struggle and all hands must be on deck in order to make this a reality and achieve the Biafra restoration mandate this year since we had made it known to the world that we are not careering freedom fighters and cannot afford any further delay. The National Coordinator of the Indigenous People of Biafra, Malaysia Mazi Anthony Obilo has exemplified and demonstrated all these unique leadership qualities in no uncertain terms. This is no wonder the people that he leads are fanatic, patriotic and committed to the Biafra restoration project as ever. This level of patriotism for Biafra nationhood demonstrated by IPOB, Malaysia, can only be achieved under a well-disciplined and focused leader. In fact, Anthony Obilo, against all odds and resistances, has demonstrably proven to the world that no excuses of any shape or form is acceptable for any failure in this struggle for Biafra restoration, which is a divine mandate that must be achieved by this present generation of Biafrans under the leadership of Mazi Nnamdi Kanu. IPOB-Malaysia is grateful to Chukwu-okike Abiama for the calibers of leadership characters he has blessed them with, starting from the Asia-Rep Mazi Onyinye Nlebedim, National coordinator Mazi Obilo and down to the coordinators of all the grass-root coordinating units as well as other principal officers. As a matter of fact, IPOB members in other countries must emulate the leadership style of IPOB-Malaysia and the love for the nationhood of Biafra exemplified by its members, in order to add more vibes in multiple fronts into this struggle in terms of aggressive change in attitude towards financial contributions especially by those in the diaspora, intensifying effort in diplomatic lobbying, and increasing international awareness as our sister Candy Stalwart is currently doing in the United states, as this year 2017 holds a lot of promises for the "Biafra-exit" from the evil contraception and enclave called Nigeria. In keeping with their usual spirit of forward-ever backward-never, and in addition to their leading roles in other key areas of this struggle, the IPOB-Malaysia have started engaging in widespread football matches (in the name of Biafra football team) with the national football teams of other countries in Malaysia including some Malaysian local football teams, in recent times. IPOB in other countries can follow suit. Also in the Media War engaged in by the Biafra media against the entire empire of Nigerian gutter media, Malaysia has contributed enormously both in the online publications as well as the world class Biafra Television programs and is poised to still engage in more giant steps in whatever area possible as may be demanded by the leadership of the Indigenous People of Biafra.